Cardiff Bay was once a run-down former industrial area, but in recent years the whole area has been turned into a modern leisure and dining destination. Where empty warehouses and rubbish- filled docks once stood, there are now waterfront shops, restaurants, apartments and hotels. One of the key parts of the transformation was the completion of a barrage in 1999, creating a huge “lake” which is now used for sailing and other water sports. There are two notable public buildings too, firstly the superbly designed Millennium Centre (pictured above) and secondly, the Welsh National Assembly. Other highlights in Cardiff Bay include the huge mirrored water feature outside the Millennium Centre which was used in the British TV show “Torchwood”. There’s also a visitor’s centre in a bizarre tube-shaped structure which explains the creation of the bay. 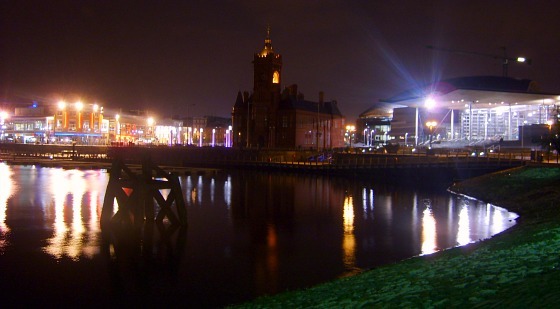 There are plenty of cafes, shops, bars and restaurants in the Cardiff Bay area and as such the area has a busy night life. Next to the Millennium Centre is a large shopping centre and around the water’s edge there are landmarks like the Norwegian church arts centre and random works of art. There is also a new Doctor Who Experience here which is packed with props from the British TV series. Despite all that, vast areas of the bay yet to be developed and you can see just how the whole area could expand further in the coming years. Staying in the Cardiff Bay area is increasing popular and there are a number of new hotels here too. Cardiff Bay is located in the old docks area. Getting to the bay from Cardiff city centre is easy now, with regular bus services, a train link and the option to take a water bus. We also tried walking which takes around 30 to 45 minutes using the main road, Rhodfa Lloyd George. Another option is the Hop-on Hop-off Bus Tour which links Cardiff and Cardiff Bay with other sightseeing locations around the city.